Sacred groves are patches of primeval forest that some rural communities protect as abodes of deities. Such “ecosystem people” draw their livelihoods from nearby resources and value nature for the ecological services it provides. 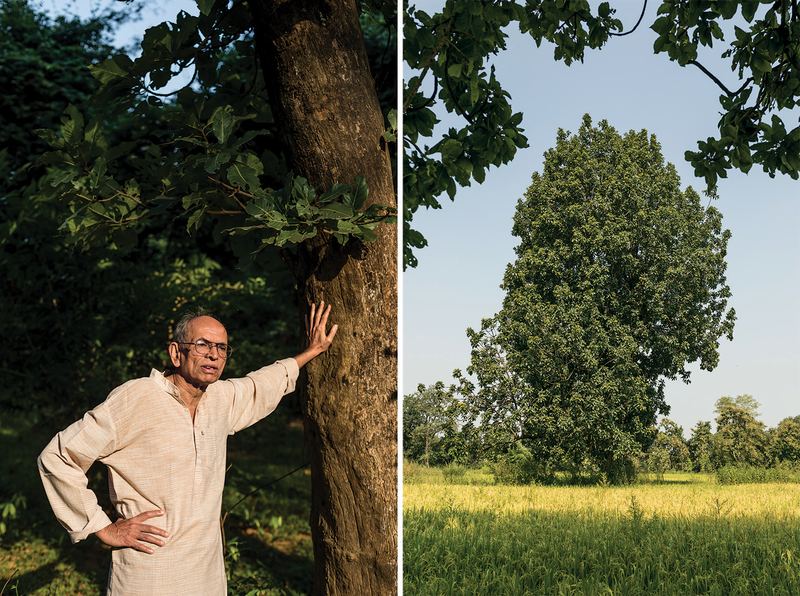 Colonial resource extraction devastated the ancient network of sacred groves in India. Thousands of groves survived, however, and some are being newly established because of the ecological benefits that communities derive from them. Empowering ecosystem people to protect their environment could be key to preserving such pristine spaces. India's Forest Rights Act of 2006, which grants communities rights to manage neighboring forests, is a significant step to this end. It was the middle of March in 2014. We were sitting under a mahua (Madhuca longifolia) tree in the hilly, forested heartland of India, breakfasting on locally grown rice, bean sprouts and fish curry. From time to time the fleshy, sugary petals of mahua flowers showered down on us, so we ended our meal with a refreshing sweet dish. My hosts were Gond tribals, residents of Mendha village in the Indian state of Maharashtra, who had declared a quarter of a century earlier that they, and they alone, would manage the region’s rich natural resources. As a field ecologist, I had been working alongside them ever since, helping to design strategies for managing their biodiversity resources. On that day I was looking forward to visiting the seven patches of forest they had identified for setting up as new sacred groves, covering more than 12 percent of their 1,800-hectare community forest. A legacy of prehistoric traditions of nature conservation, sacred groves are patches of forest that rural communities in the developing world protect and revere as sacrosanct. Deeply held spiritual beliefs ensure that not a tree is felled nor a creature harmed within its boundaries. (In times of dire need, such as if a village burns down, permission may, however, be sought of the grove’s deities to extract a limited quantity of wood for reconstruction.) Treasure troves for naturalists, the groves often serve as the last refuge for magnificent and ancient trees, as well as for species of lianas, medicinal plants, macaques, deer, birds, lizards, frogs and other creatures that have become rare elsewhere in the landscape. Originally widespread in the Old World, sacred groves were reported in Greek and Sanskrit classics but were essentially wiped out in Europe by the arrival of Christianity and its attendant anthropocentrism. The Christian church, with its towering pillars and soft light filtering in through colorful stained-glass windows, is said to evoke the sacred groves of yore. Such protected copses are still found in parts of the Middle East, Africa and Asia. Over almost half a century I have explored a great many sacred hills, river origins, river stretches, ponds and groves in India, Bhutan and Japan. I have witnessed sacred groves being destroyed but also being preserved, revived or even newly established in the face of the active hostility of the developmental state. 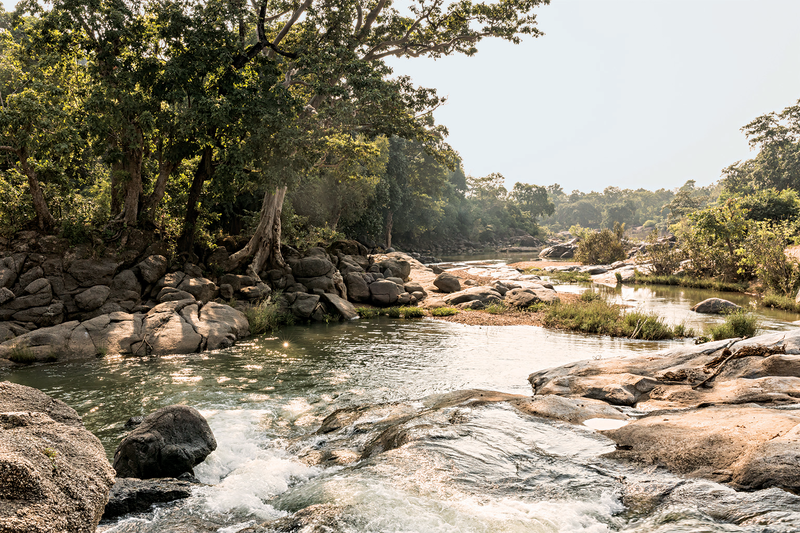 An ecological crisis in the Indian subcontinent, brought about by relentless commercial exploitation of natural resources, is prompting a vibrant revival of these sacred spaces. This assertion of ancient values of reverence for nature, too often derided as primitive superstition, represents the most hopeful news about Indian ecology to emerge in decades. Conventional conservation follows a top-down strategy modeled on Yosemite National Park, whose establishment in 1890 followed the forcible expulsion of the Native Americans who lived there. As journalist Mark Dowie described in 2009 in Conservation Refugees, this Western concept of a wilderness free of humans was imposed around the world. Large conservation agencies, partnering with governments in developing countries, created protected areas for charismatic creatures such as tigers and lions by expelling millions of humans from the forests and savannas in which they had lived for hundreds of years or longer. Not only did these evictions cause immense suffering, they also proved counterproductive as a conservation strategy. In many cases, the locals had nurtured the forest and protected its biodiversity in ways that became clear only in hindsight—such as by controlled burning that removed invasive shrubs or helped to regenerate seeds of valuable trees. In recent years, however, a radically different, bottom-up conservation strategy is gaining ground worldwide. About 40 percent of the earth’s wildlife-rich forests are still defended by the local groups who live in and around them. As this story indicates, empowering such “ecosystem people”—who live close to nature and can directly observe and appreciate the manifold benefits it confers—could be the most effective way to protect what remains of the planet’s biodiversity. My love affair with sacred groves began in August 1971. Soon after returning to India with a doctoral degree from Harvard University, I set out on a field trip with my former botany teacher, V. D. Vartak. We trekked into the northern Western Ghats, a chain of hills running along the western edge of the Indian peninsula. I had grown up in these parts, and I got progressively depressed at the sight of the barren, eroded hills that had been covered with tropical rain forest until the early 1960s. Suddenly we were confronted with a five-hectare patch of luxuriant evergreen forest, within which towered four trees of dhup (Canarium strictum)—the northernmost representatives of a species characteristic of the southern Western Ghats, 500 kilometers away. Vartak explained that this grove, named Dhuprahat, had survived because it was sacred to a local mother goddess—and that several other such remnants of primeval vegetation were scattered all over the Western Ghats. On returning, I read up on sacred groves. Though mentioned frequently in literature on cultural and religious beliefs, I could find no systematic investigations of the phenomenon, let alone studies from an ecological or social science perspective. The reigning hypothesis among conservationists was that they represented lingering elements of nature worship prevalent in all supposedly primitive societies; they had no secular functions but persisted purely because of superstition. That hypothesis implied that sacred groves should be concentrated at religious sites such as mountain peaks or sources of rivers. It seemed more plausible to me that whereas sacred groves may receive protection through religious beliefs, the system is grounded in secular benefits, such as securing freshwater sources. According to this hypothesis, sacred groves would not be restricted to particular kinds of habitats but would be distributed throughout the entire range of habitat types. I set out to collect primary field data to test this prediction. It was a fascinating experience: trekking through the northern Western Ghats, finding villages with significant patches of sacred groves, making notes on their size, botanical composition, animal life and location in relation to topography, settlements and cultivation and talking to local people about their traditions, beliefs and ecological knowledge. The hospitable villagers readily granted my request to share their meals and to shelter under their roofs for the night. The resulting data clearly showed that people perceived and valued the ecosystem services that the sacred groves offered and were continuing to protect them because they wished to avail themselves of these benefits. At the same time the groves protected water sources, they served as refugia for animals exploited outside the sacred groves. One notable example of the latter involved the Jenu Kurubas of Nilgiri Hills. Their name means “harvesters of honey,” which they collected by setting fires under the hives of the wild rock bees wherever they found them—except in the network of sacred groves in their region. They were fully aware that the taboo on harming the hives inside the sacred groves ensured continued persistence of the rock-bee populations. The people of Mendha and the Jenu Kurubas believe that they are part of a community of beings, comprising not only humans but also mountains, rivers, trees, animals and birds. These nonhuman community members benefit them in many ways; hence, humans must reciprocate through restrained use, even veneration and total protection. Such a feeling must have prevailed in all early cultures, such as those of hunter-gatherers, who live by it to this day. The need to protect the wilderness would have become all the more urgent when people took to cultivating plants and radically modifying the original ecosystems. Agriculture began in northern India around 6,000 years ago. Initially patches of forest most likely were cleared for planting, being abandoned after two or three years in favor of a fresh site, in a process known as shifting cultivation. Indologist D. D. Kosambi surmised that the practice of always protecting specific parts of the forest from clearance as sacred groves—and of never cutting valued trees such as mahua (or members of the keystone resource genus Ficus)—probably arose at this time. Maintenance of sacred groves was integrated into land-use practices even as permanent fields began to replace shifting cultivation. Along with settled agriculture came the first city-states. The Indus Valley civilization gave way around 3,500 years ago to Vedic kingdoms. According to an interpretation of the epic Mahabharata by anthropologist Irawati Karve, these early states expanded their frontiers across the Gangetic basin by burning forests to evict hunter-gatherers and to create more fields for pasture and taxation. With cultivation extending across the plains, a resource crunch showed up. The evidence, albeit patchy, suggests that soil fertility and possibly rainfall declined, whereas leaf manure, fruit trees, wild game and other forest resources became scarce. Studies by historian Romila Thapar indicate that Jainism and Buddhism, religions that preached vegetarianism or other forms of restraint in consumption, arose at this time—in direct response to the ecological crisis. These faiths bolstered the local tradition of protected groves. Gautama Buddha himself was born in the sacred grove of Lumbini about 2,600 years ago. Sufi Islam, which spread across the Indian subcontinent in the 10th century, also supported these conservation practices. The conquest of India by the East India Company, which began in 1757, almost wiped out these millennia of ecological adaptation. Early British travelers described India as an ocean of trees, but the company proceeded to rapidly “enclose the commons.” Fields, streams, ponds and other resources were seized from villagers and became state property, many being handed over to English-style landlords who agreed to pay exorbitant taxes extorted from the (now landless) laborers and sharecroppers. The landlords expunged most sacred groves on their holdings to expand fields. Subsequently the state appropriated virtually all forests with the claim of managing them in an enlightened scientific fashion. Community control and accompanying conservation measures were declared to be thoroughly illegitimate. Especially fierce criticism was reserved for the practice of shifting cultivation, prevalent in the central Indian forested belt, of which Mendha was a part. Locals pleaded in vain that the practice was nondestructive: the cleared patches were left to regrow for up to 15 years. Moreover, they always left all mahua trees, which they considered sacred, intact. Under British rule, the entire forest, including the huge, ancient mahua trees, was being razed to the ground to facilitate the harvesting of timber. By 1860 Indian forests had been substantially depleted, and moves to moderate the pace of their destruction led to the appointment of an inspector general of forests, German botanist Dietrich Brandis. (The British had little expertise in forestry, having long consumed the forests of their own isles.) Admiring the excellent community-based management of Indian villagers, Brandis lamented the decimation of the once extensive network of sacred groves and asked that a substantial part of forest be left in charge of the people. Although they reluctantly agreed, the colonial rulers did not implement this provision until around 1930 and that, too, on a very limited scale. Instead the forest department grew into the biggest landlord of all, eventually controlling more than a fifth of the country’s land. Community rights over forests were abolished. Derecognition of their ancient rights meant that villagers could no longer prevent outsiders getting in and ruthlessly exploiting resources from their commons. The resource regime had changed from “community control” to “open access.” Elinor Osrom, who won a Nobel prize in economics in 2009 for her research, demonstrated by a remarkable combination of theoretical, field and experimental studies that the open-access common-property regime is subject to abuse. Restrained utilization or complete protection of common-property natural resources becomes possible only in the presence of firm community control. Despite the imposition of an open-access regime, communities in the central forested tract of India continued to manage their forests well until independence in 1947. Mahatma Gandhi, who led the struggle for independence, had consistently pleaded for respecting and empowering India’s village communities. His vision was, however, rejected in toto by the government of independent India, which proceeded to further consolidate the forestry establishment. As a result, the disempowerment of Indian village communities gathered pace. In terms first used by Raymond Dasmann, one of the founders of modern environmentalism, the people of Gani were “ecosystem people,” and the chief of the forestry department belonged to the class of “biosphere people.” Ecosystem people largely depend on their own muscle power and that of their livestock to gather and process most of the resources they consume, which comes from within an area of roughly 50 square kilometers around their homesteads. Living in such close proximity with their resource base, ecosystem people fully understand and appreciate the bounty that nature confers. Biosphere people, on the other hand, have extensive access to additional sources of energy such as fossil fuels, which enables them to transport and transform large quantities of materials from all over for their use. Their ecological footprints are tens or hundreds of times higher than those of the ecosystem people. The biosphere people see distant rural locales merely as sources of timber, mineral ores or hydroelectric power or—at best—as tourist resorts. To them, ecosystem people are either a source of cheap labor or a hindrance to accessing the resources they need or want. They disregard the ecosystem services valued by the locals. The ruling classes in India, as in across the world, are biosphere people, and they claim that they manage society for the common good. The reality is quite different, as I saw in my early fieldwork in the then remote, narrow Ambi Valley in the Western Ghats. The villagers cultivated rice in the valley and practiced shifting cultivation on the hill slopes. While clearing forest patches for cultivation, they left intact extensive tree growth of mango and myrobolan that brought them a small but regular income. When dam construction began in the 1950s, however, motor vehicles began to enter the valley, confronting the peasants, who until then had seen little cash, with the market economy. Charcoal merchants told them that because they would be relocated soon, they might as well sell the trees on their hill slopes. They brought along Hindu priests from the nearby city of Pune, who assured the villagers that they would perform appropriate ceremonies to placate the offended deity and build a pretty little temple to house it. Huge mango and myrobolan trees, each worth hundreds of rupees, were sold for as little as half a rupee. The reserve forests on top of the hill, controlled by the state, were also wiped out by the charcoal merchants in collusion with corrupt forest officials. In the end, the villagers displaced by the dam were never adequately rehabilitated. Most were forced to relocate onto the now thoroughly denuded hill slopes, to eke out a living as best they could. The plentiful water stored in the dam serves the organized industries of Pune and the holders of irrigated lands to the east. The cost of all the environmental degradation was, in the short run, thrust on the villagers of Ambi Valley. In the long run, of course, the entire society is the loser. For me, these experiences strengthened the hypothesis that, six millennia since the inception of sacred groves in the Indian subcontinent, spiritual beliefs were no longer sufficient to ensure their survival in the face of sustained assault from commercial interests. Since independence, India has displaced tens of millions of people from forests and fields to make room for mines, dams and other development projects. If the sacred groves are to survive, I surmised, the ecosystem people must be able to retain access to the ecological services they offer. If the hegemony of biosphere people destroys the possibility of such benefits, the villagers would have little motivation to protect the groves—which would then be wiped out. Along with anthropologist B. Mohan Reddy and Natabar Shyam Hemam, both then at the Indian Statistical Institute, I tested this hypothesis in the 1990s in the states of Manipur and Mizoram in the foothills of the eastern Himalayas. Elders told us that in the past, up to 30 percent of land and water were fully protected as sacred sites. Certain valued resources such as Aquilaria, with its fragrant wood, or bamboo were harvested with great care. When the British established control over this region in the early 20th century, however, they assigned the ownership of all land to various tribal chiefs, reducing the rest of the populace to sharecroppers. Many of these chiefs forcibly liquidated the forests to make a quick buck. Even greater damage followed in the 1950s, when missionaries converted the entire tribal society of many of the northeastern states to Christianity. Their hostility to “pagan” beliefs led to the destruction of the large network of sacred groves and ponds. (Sacred ponds are water bodies, often within sacred groves, in the vicinity of which only one human activity is permitted: the taking of drinking water, which is typically pure and free of pathogens.) Significantly the tiny Buddhist country of Bhutan, nestled among India’s northeastern states, never came under colonial rule or missionary influence and still harbors a network of sacred groves that is estimated to cover 20 percent of its land surface. As the sacred groves were cleared, however, people began to realize they had fulfilled a number of valued ecosystem services, in particular as firebreaks. The fires that they set to clear plots for shifting cultivation stopped when they reached these dense, drippy patches of rain forest. In consequence, a few years after the demise of sacred groves, several villages, such as Saichang of the Gangte tribe in Manipur, reinstituted protection to forest patches. These refugia are no longer regarded as inviolable as abodes of spiritual beings. 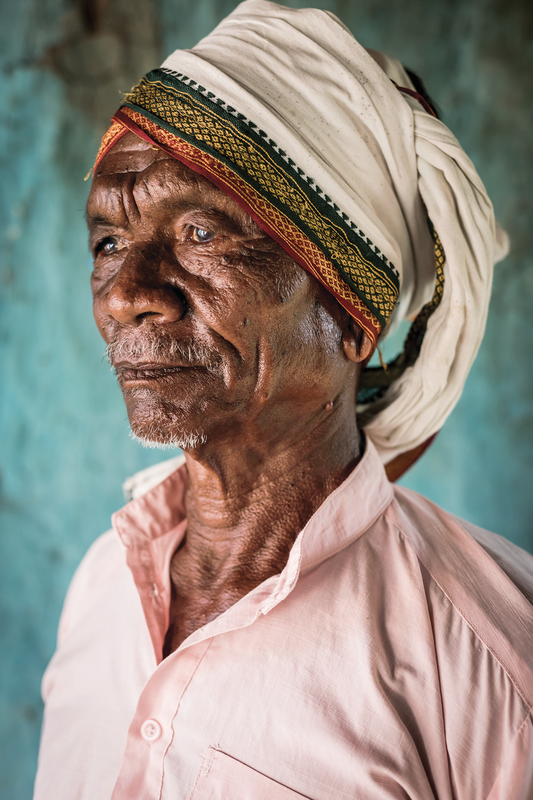 Even so, the system of community-based vigilance and protection is identical to that of earlier times, and they are still called gamkhap (in the Gangte language), like the sacred groves of yore. These findings strengthened my conviction that even if spiritual beliefs give way to secular ones, sacred groves could survive if ecosystem services reached the ecosystem people. 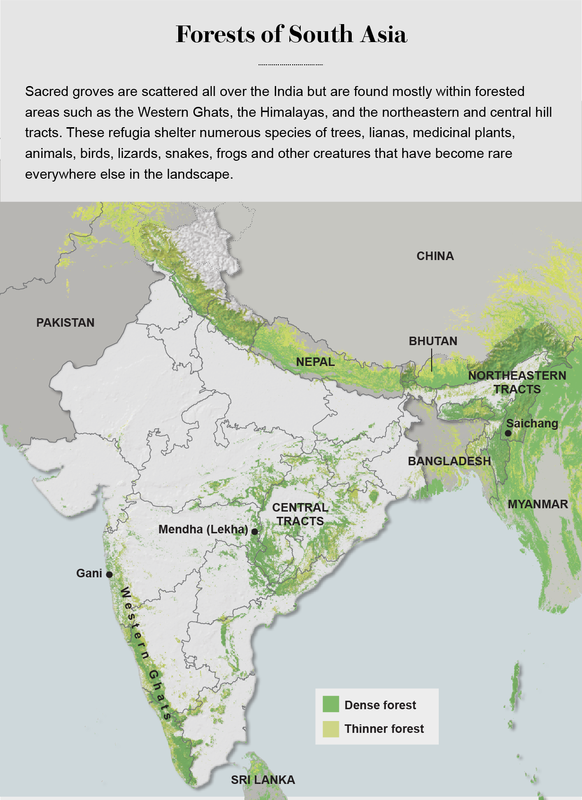 For the people of the central forested tract of India, the tide began to turn in the 1980s. A spirited struggle—“Save the Forest, Save the People”—broke out to assert the forest rights of local communities. The people of Mendha—which locals call “Mendha (Lekha)” because of its proximity to a larger village, Lekha—played a leading role. Their first success, small but significant, came in 1991, when a cooperative society that the women had formed obtained rights to manage a stone quarry that was threatening a sacred site in the community forest. The movement continued to spread and gather strength until it culminated in the passage of the Scheduled Tribes and Other Traditional Forest Dwellers (Recognition of Forest Rights) Act of 2006. Professing to undo the injustice that began in the British regime, the act conferred not only individual but also, and more important, community rights over certain areas. These included the right to protect, regenerate, or conserve and manage local resources such as bamboo. In 2009 Mendha and its neighbor, Marda, became the first villages in India to win community rights over their common forest. At long last, they were able to exclude outsiders and to ensure that insiders exercise due restraint in harvesting natural resources. I was fortunate to be present during their discussions for formulating regulations for sustainable resource use. The preface to their management plan includes a quotation from an elder, Dukku Chamaru Tofa, capturing a sentiment that is at the core of sustainability: “Who owns this forest? Not the government, not the village, nor any of us. The real owners are those not yet born. We are merely custodians, entrusted with the privilege of taking only what we need while leaving the heritage intact for future generations.” The villagers also resolved to identify areas to be set up as new sacred groves, called pen geda (in the Gondi language)—but incorporating the scientific wisdom that these should encompass the full range of ecological habitats and species. Although the forest bureaucracy is dragging its feet on ceding control, thus far 3,600 villages in Maharashtra have obtained community rights to neighboring forests. Just as exciting, across Gadchiroli District, where Mendha lies, efforts are under way to create a Mahasangh, a federation of village councils. 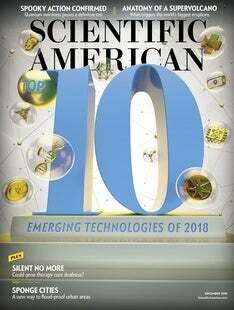 This promises to be a fascinating experiment in cooperative efforts to protect natural resources on a broad scale. At a meeting of representatives of some 200 village councils this past February, they resolved to set up around 10 percent of their community forest resource areas as newly constituted sacred groves. So there is ever stronger support for my belief that sacred groves will be preserved, revived or even newly created. That will require empowering the ecosystem people to fight back against the economically and politically powerful interests that want to grab timber, minerals, land and water for consumption by the biosphere people. Across the globe, similar grassroots movements are gaining ground. Local peoples are opposing tar sands extraction in Canada, oil pipelines in the U.S., dams in Brazil, mines in New Guinea and the replacement of rain forest with palm oil plantations in Indonesia. These grassroots defenders of the environment are being forcibly suppressed, but they are also winning significant battles. After our breakfast in Mendha in March 2014, my hosts and I spent the day visiting the new sacred groves. Some had magnificent forest stands of arjun (Terminalia arjuna) and bondara (Lagerstroemia microcarpa), as on the rather inaccessible Saheban Metta Hill. Others had been chosen to provide a secure habitat for sloth bears and yet others to represent rocky outcrops and other special habitats. This was a fitting culmination of my romance with sacred groves of India, begun almost half a century earlier. This Fissured Land: An Ecological History of India. Madhav Gadgil and Ramachandra Guha. Oxford University Press, 1992. Ecology and Equity: The Use and Abuse of Nature in Contemporary India. Madhav Gadgil and Ramachandra Guha. Routledge, 1995. The Unquiet Woods: Ecological Change and Peasant Resistance in the Himalaya. Ramachandra Guha. University of California Press, 2000. Sustaining the Variety of Life. Stuart L. Pimm and Clinton Jenkins; September 2005. Madhav Gadgil founded the Center for Ecological Sciences at the Indian Institute of Science in Bengaluru, India. His research helped to establish the country's first biosphere reserve in the Nilgiri Mountains. He has received many awards, including the Padma Bhushan and the Tyler Prize for Environmental Achievement.